It’s no secret; I love my job. I’m incredibly grateful to work for a company that supports me professionally and to address life-changing causes like empowering military families and working with athletes from the United States Olympic Committee (USOC). Because of our USOC sponsorship, I get to work with elite athletes. I also enjoy the privilege of having retired athletes on my team. 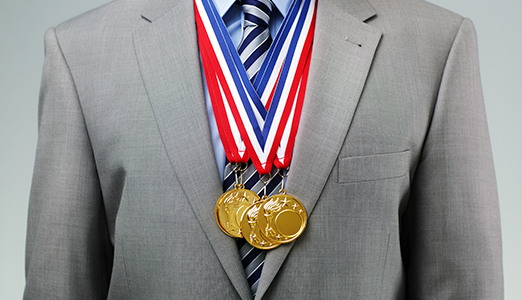 Those athletes have taught me five important managerial lessons. 1. Embrace a daily discipline. Elite athletes know the importance of keeping their fundamentals sharp. They succeed by perfecting the basics through hard work and consistency. For the most part, they live an orderly life while they are training. It’s how they accomplish their goals, nurture their bodies, and stay focused. Embracing a daily discipline at work keeps me organized, accountable to my team, and focused on achievable goals. My team thrives on modeling daily disciplines—responding to emails promptly, always arriving on time, and journaling their work. Some daily disciplines seem mundane, but over time, they form the foundation of excellence, separating high performers from the rest of the pack. Success doesn’t happen by default. To quote, well, everyone’s high school coach, “If you fail to plan, you plan to fail.” Athletes who win world championships—like the athletes on my team—win because they set a series of individual goals and attained them. Goals help athletes stay focused and motivated. Knowing how to set goals and achieve them is one of many traits that make athletes stellar employees. Working alongside athletes has reinforced the importance of setting goals and maintaining a laser sharp focus to reach them. It comes second nature to athletes and should come second nature to every manager. After all, you can’t manage what you don’t measure. In sport, mental resilience is as important as physical strength. Athletes who ultimately win are those who condition their minds to persevere after a loss. In business, overcoming a fear of failure is key to mental toughness. The athletes on my team have taught me that it takes more than being competitive to win. To win or achieve a goal, you must challenge yourself to exceed expectations and pick yourself up after adversity. For a time during her athletic career, my present teammate lived out of her car in order to pursue her Olympic dreams. Her drive and determination is infectious and makes me work harder to be a better manager. She personifies grit that most people could only dream of. 4. There are times to coach and times to lead. In team sports, good coaches take the “long view,” investing time in developing their athletes’ fundamental skills in order to elevate the team’s proficiency. Leaders, by comparison, are focused on today’s game, inspiring people to make maximum use of their current skills to accomplish the task at hand. As a manager, you wear both hats: coach and leader. Sometimes these two imperatives conflict—energy devoted to developing your people can feel extravagant when deadlines are looming. Conversely, if you fixate on whack-a-mole deadlines, you find yourself a year later surrounded by a burned-out, underdeveloped team. Ultimately, you get to choose which hat to wear, and when. Choose well, and everyone will thank you. Keeping your focus amid myriad distractions can be difficult. Athletes develop an uncanny ability to block out cheering, jeering crowds and other distractions by being fully present. While it’s challenging, I do my best to remain present when with my team, whether teleconferencing or in person. I like the motto, “Wherever you are, be all there.” I resist answering emails during conference calls. I silence my phone before a conversation. I practice active listening. I take notes during meetings, partly for myself, but also so that my team understands I am hearing them. We are all constantly bombarded by external stimuli, but—like an NBA star at a free throw line—we also choose what to dial in or tune out. Be present, and you will be productive. I’m certain that working with athletes has made me a better manager. They inspire me every day to bring my “A” game. They expect nothing less than your best, and they give everything beyond their best. Athletes exude an energy that motivates all of my colleagues to work harder. As a manager, I’m responsible for setting the tone, culture and team environment. Take it from me: The best way to do that is to bring an elite athlete onto your team. Rachelle Chapman joined Adecco Group, the global leader in workforce solutions in 2005 and currently serves as the Senior Manger for Strategic Partnerships and is the Military Liaison for Adecco. Rachelle manages the Adecco Military Alliance program; a recruitment program aimed at hiring military spouses and veterans. She also manages the Athlete Career and Education Program, a program designed to provide Olympic and Paralympic athletes with career counseling, job placement assistance and employment opportunities. Adecco is an official sponsor of the United States Olympic Committee and partners with the USOC to facilitate the ACE program. In addition, Rachelle oversees Adecco’s experienced worker program.